As the saying goes, April showers bring May flowers—not to mention some of the nastiest bouts of flu of the whole year. Judging from this special mid-week installment’s crop of cases, bags, and protectors, however, our iPads will at least get plenty of protection from the vagaries of the weather. G-Form: If Wolverine ever bought an iPad 2, he would undoubtedly want to carry it around in one of G-Form’s new Extreme Sleeves (iPad & iPad 2; $50), which look like they were plucked right out one of Jack Kirby’s early installments of The X-Men. The cover, which is soft and flexible, yet tough and durable, is available in black or yellow and can even accommodate a Smart Case-clad iPad 2. Green Onions Supply: This firm has just announced its new line of screen protectors for the iPad 2, which come in three different models. The Anti-Glare ($25), as its name implies, is a matte film designed to minimize reflections. This is also the job of the AG2 ($25), whose more limited light-scattering capabilities result in a crisper screen image. Finally, the Anti-Fingerprint ($25) focuses its abilities primarily on making sure that your skin oil stays where it belongs—most definitely not on the surface of your tablet. Hard Candy: The White Collection brings together three of Hard Candy’s designs in the eponymous color: the CandyConvertible (iPad 2; $45), a folio made of animal-friendly faux nubuck; the Bubble Sleeve (iPad & iPad 2; $50), a zippered sleeve made of EVA foam with a bubble design; and the tough-looking StreetSkin (iPad 2; $40), which features a removable screen cover with a special hinge design. Logitech: The venerated accessory manufacturer is rebranding Zagg’s Zaggmate, a screen-protecting case, made out of aircraft-grade aluminium, with a built-in rechargeable Bluetooth keyboard. (Zagg also manufactures films that can be used to protect the back.) We reviewed the version of the Zaggmate keyboard for the original iPad. Lost Dog: The Protecting Pouch ($39) is a microfiber sleeve designed to fit the iPad 2 perfectly. Each sleeve is hand-crafted, is compatible with the Smart Cover, and even features an additional A4-sized pocket for carrying your papers. Lost Dog’s Leather Cover ($70) is made of hand-grafted premium leather and features a unique design that can be rolled up to support the iPad in a variety of portrait and landscape angles. Moshi: Who says screen protectors should just be transparent? Moshi’s iVisor AG closely replicates the iPad 2’s frame while protecting its screen from scratches and smudges. Naturally, the protector features all the appropriate cutouts—including one that allows you to use the iPad 2's built-in front-facing camera. Unlike most other screen protectors, the iVisor AG adheres only to the iPad's bezel, not the screen, so there's no risk of bubbles or dust pockets blocking your view—the company guarantees a bubble-free installation. The iVisor is available for $30 in either black- or white-bezel models. Padacs: The Ziva ($30; iPad 2) is very similar to Apple's Smart Case, but it wraps around your entire device for maximum protection. The case features the appropriate magnets for a secure closure and for putting the iPad to sleep when the cover is closed, and it can be arranged to act as a stand or typing platform. The standard Ziva is made of faux leather, but a model made of the real thing, the Ziva Pro ($45), is also available. 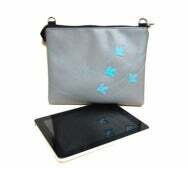 Queen Bee Creations: The Cozy iPad (iPad & iPad 2; $50) is a handy bag made of environmentally-safe faux leather and designed to fit your favorite tablet. The Cozy iPad comes complete with a shoulder strap and can also fit a variety of other devices, including the Kindle. The bag is available in a variety of color combinations and motifs, including many that feature nature-inspired themes with plants and trees, including the “Flock” design pictured here. SGP: The Illuzion is a leather sleeve for both iPad and iPad 2 that features a soft, microfiber “chamude” interior. The sleeve is designed to add style to your tablet, but not bulk or weight, which makes it perfect for travelling in style without breaking the bank. The Illuzion costs $60 and is available in blue, green, orange, pink, white, brown, black, or red. Trident: The Aegis (iPad; $40) is a wraparound case that combines a soft silicone interior with a rigid, polycarbonate shell for a very unique feel. The case features all the appropriate cutouts—including one that leaves the Apple icon on the back of your iPad visible. The case also provides an anti-skid grip for safe handling, and it's available in blue, yellow, black, red, pink, or green. XGear: The EXOSkin ($30) is an interesting, carbon-fiber protective skin for the back of your iPad 2 that adds virtually no bulk to the device. The skin is available in black or white, with different versions for the 3G-equipped and Wi-Fi iPad models.